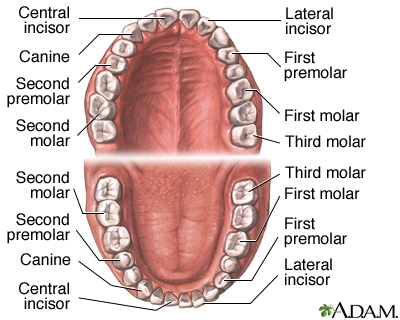 The appearance of normal teeth varies, especially the molars. Abnormally shaped teeth can result from many different conditions. Specific diseases can have a profound effect on tooth shape, tooth color, time of appearance, or absence of teeth. Updated by: Ilona Fotek, DMD, MS, Dental Healing Arts, Jupiter, FL. Review provided by VeriMed Healthcare Network. Also reviewed by David Zieve, MD, MHA, Medical Director, Brenda Conaway, Editorial Director, and the A.D.A.M. Editorial team.